We can’t accurately describe how we feel this evening, shell shocked, horrified, downhearted, despaired , angry, heartbroken all words that are just not strong enough to convey what we saw today, what we had to deal with. The smell, the live maggots, the pain in the eyes of an old pony, a pony on her knees begging for help, willing the pain to go away, will haunt the team forever. We are completely shocked that poor Hanora had been left with rope embedded into her face for at least a year, day after day people passed her, ignored her, dismissed her as another “nuisance” , turned their back on her in her hour of need. How many people pass in a year?? Our guess is thousands. Hundreds/ thousands of people saw this little girl in agony and walked away. 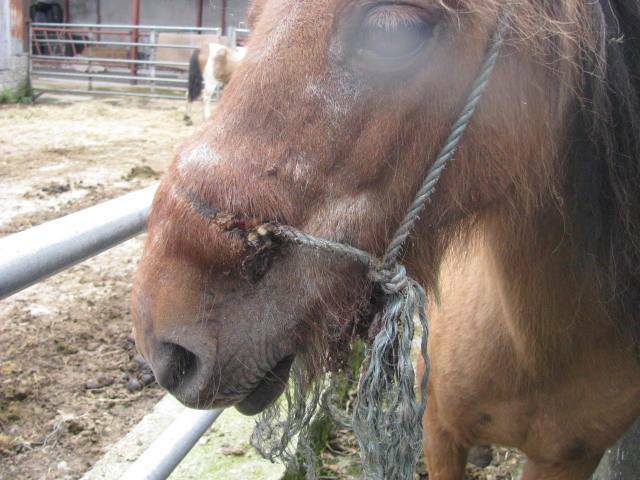 We would beg you all if you see a pony in pain or injured ask someone for help! If you are not a horsey person find the nearest riding stables and ask who you could ring about it, ask welfare groups, don’t assume someone else will help. As we learned with Hanora, they won’t. We would appeal for anyone who recognises this pony to contact us, someone somewhere knows this little girl, she was someone’s pet , so quiet, so eager to please. If the person who abandoned her in Claregalway is reading this, you should be ashamed of yourself, when we find out who you are, we will make sure the world knows it. You left her in agony! Unthinkable, unbearable pain. We thought long and hard today on the best course of action for this small girl standing 11.2hh who served many years as a faithful companion to a family somewhere, determining whether to put her to sleep or not, we spoke with several vets and had her assessed, all of whom drew the same conclusion, they felt we needed to fight for her. It was decided then and there, as long as she continues to fight and we can keep her from discomfort we will take on the huge task of helping her recover, she had battled so long on her own, she wants our help, she needs all of us to pull together and walk this long treacherous road with her. You are not alone any longer little pet, we’ll all stand by you. The vet managed to remove the rope, live maggots made their way out, the stench overpowering, she has been given a variety of painkillers and antibiotics and at the moment she is comfortable, even having a little meal something she could not manage for a long time, the equine dentist will see to her in the coming days and xrays will be taken to assess the damage. She will not get better over night folks but together we can help Hanora have a quality life, give her happiness, give her the gift of compassion and love.